Poster of the original 1938 Indian painting. An original painting by Milwaukee motorcycle artist Mathew Hintz of a 1938 Indian Model 438 Four motorcycle will be featured in the auction catalog and on a daily show program for the 2017 Mecum Las Vegas Motorcycle Auction to be conducted on January 25-28. The painting captures the streamlined front fender and massive, longitudinal engine of the sporty, 100-mph Indian motorcycle, an award-winning restoration by Elmer Lower that will be a main attraction at the auction, offered at no reserve on Saturday, January 28, as lot S167. Hintz is also pleased to announce that the original 36 x 48-inch museum-quality painting has been donated by the artist for auction, with all proceeds directed to Curing Kids Cancer. The painting will be offered on Friday, January 27, as lot J80. 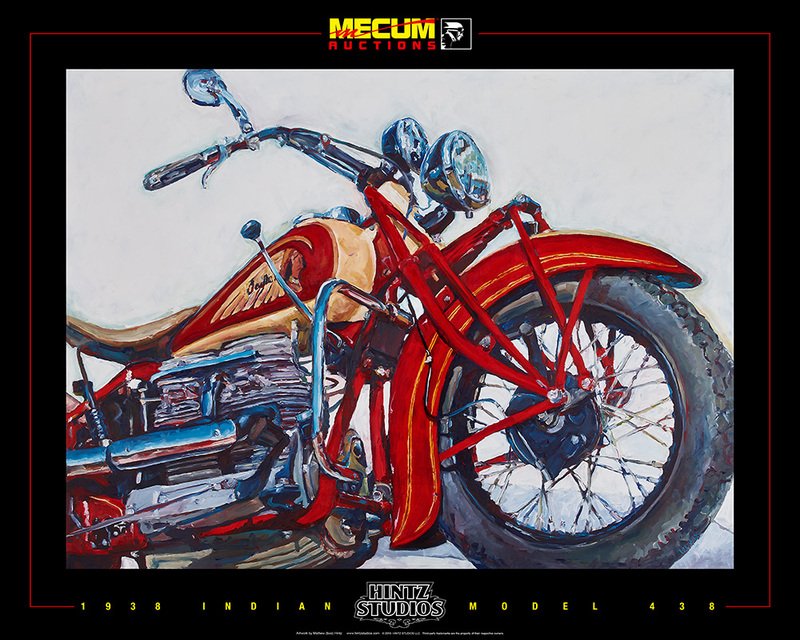 Auction attendees will be able to see artist Mathew Hintz working live on the auction floor as he creates additional paintings of vintage motorcycle subjects. Specializing in “gas and oil” subjects, Hintz has worked professionally for more than 20 years to develop the techniques behind his distinctive sculptural layered-paint portraits and rugged charcoal drawings. His commissioned artwork aims to capture the mechanical detail of a cherished machine and evoke emotion and pride in its owner. Hintz has also worked since 1998 as a contract artist to the Harley-Davidson Styling Department creating motorcycle paint designs, helmet graphics, logos and tank medallions, as well as the original cover art for Harley-Davidson Owner Manuals. In 2016 Hintz was licensed to produce artwork for Ford Images.